While two weeks notice is standard, sometimes unusual circumstances lead someone to quit immediately. 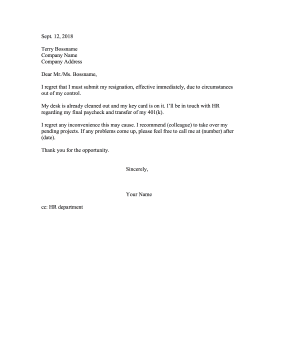 This letter explains the job is being quit without notice and gives guidance on where to send a final paycheck. I regret that I must submit my resignation, effective immediately, due to circumstances out of my control. My desk is already cleaned out and my key card is on it. I'll be in touch with HR regarding my final paycheck and transfer of my 401(k). I regret any inconvenience this may cause. I recommend (colleague) to take over my pending projects. If any problems come up, please feel free to call me at (number) after (date).